So, you’ve completed an Everything DiSC® Workplace profile. You may have even joined a class to get you up to speed on the styles of Dominance, Influence, Steadiness, and Conscientiousness. As a leader, you understand how behaviors in the workplace impact productivity, innovation, and comfort. As a manager, are you masterful in the key areas of communication, managing performance, leading people, coaching, resolving conflict, and building strong teams? How do you apply Everything DiSC to “up your game” in these 6 key areas of leadership? Well, there is a lot that you can do to apply Everything DISC® to be more effective. A good place to start is getting to know what companion DiSC tools are available to lean on. Did you know that there is an entire family of Everything DiSC® profiles, each designed for a particular purpose? Using the right DiSC® assessment at the right time can help you and your team increase creativity, collaboration, and camaraderie. Start navigating the top Everything DiSC® tools with these questions DiSC practitioners ask the most. Question #1: What is the difference between Everything DiSC® Work of Leaders® and the Everything DiSC® Management Profile? The Everything DiSC® Management Profile helps leaders strengthen their leadership effectiveness in one-to-one relationships. The feedback report helps people understand how their DISC style influences their approach to essential functions of management: directing & delegating, motivating others, developing others, and communicating up to their manager. When to use it: This is an excellent tool to be used in management classes, leadership classes, and coaching. The Everything DiSC Work of Leaders® profile focuses on a leader’s ability to communicate effectively in one-to-many environments. Furthermore, Everything DiSC Work of Leaders® gives people feedback on how their DISC style influences the way they create a vision, align people to a vision, and execute a vision. We used this assessment with a group of executives before their strategic planning session. During the session, the Everything DiSC® Work of Leaders Group Report revealed to the executives their strengths and weaknesses in creating, aligning and executing a vision. As a group, they scored high in the areas of Creating a Vision: Boldness and Exploration. They also scored high in the area of Execution: Momentum. But their results also reflected their typical practice when, in the past, they would create a vision for a project. They usually rolled it out quickly and employees resisted the new ideas and plans. By seeing their data on paper, the executive team quickly realized ways to boost their effectiveness. They needed to test their assumptions with their direct reports. Senior leaders needed to get more feedback about how to implement the plan. They needed to create more structure for implementation. More dialogue would create more buy-in. Therefore, vision implementation would be more successful. When to use it: Use both assessments in management classes, leadership classes, strategic planning, and coaching. Question #2: As a leader, which assessment should I use to analyze my leadership skills? Everything DiSC 363® for Leaders is a multi-rater assessment. It is designed to give feedback on leadership performance. The last 3 in 363 is symbolic of one of our favorite features of this assessment. The Everything DiSC 363® report provides the leader a list of their 3 top strengths and 3 priority challenge areas. Everything DiSC 363® for Leaders provides leaders with 26 pages of feedback from 4 groups of raters: manager, peers, direct reports, and others. The “others” rater category can be used for other people in the organization, vendors, and customers. The rater feedback is summarized and compared to the leader’s self-rating. The report shows feedback by rater group. Specific rater feedback helps the leader assess how he/she is doing with each rater group. Great news! With 363, the leader receives valuable information about their top 3 strengths and their top 3 areas of development. Each area of development includes strategies that can help the leader improve in their challenge areas. When to use it: We love to use this tool as a pre and post assessment in management courses, leadership courses, and executive coaching. Question #3: How do I help two people see that much of their conflict is coming from not appreciating each other’s DiSC® styles? The Everything DiSC® Comparison Report is one of the best tools to help people start building a more comfortable and productive working relationship. The Everything DiSC® Comparison Report allows any two Everything DiSC® participants to see their similarities and differences in a series of different continua. 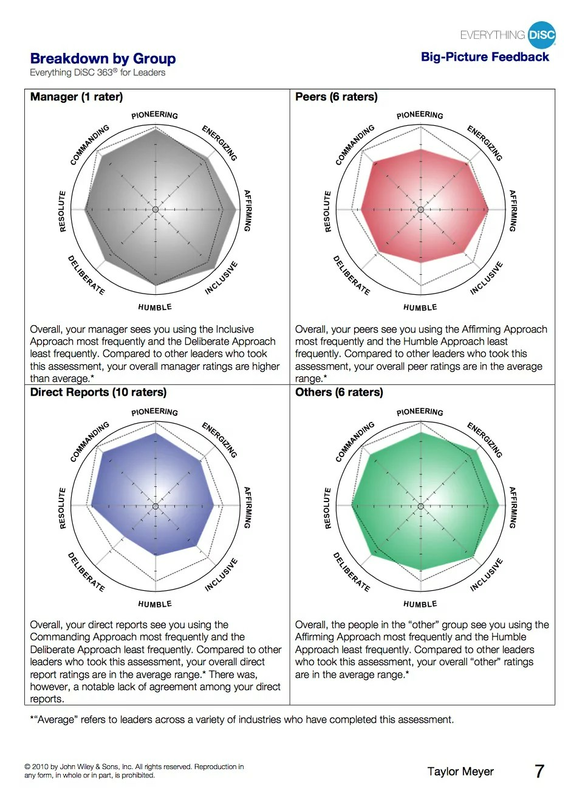 Use the comparison report to generate the most meaningful conversations by talking about their biggest differences based on their style. It is especially relevant since the report guides participants to talk about their similarities and differences. Overall, the purpose of this report is to improve communication and efficiency, while reducing tension and misunderstandings. Question #4: Is there a way that I can see all of my team member’s styles at a glance? Yes, many of our managers want to be able to see their team’s DiSC® styles at a glance. Two reports, Everything DiSC® Group Culture Report and Everything DiSC® Facilitator Report, can help. As you can see, the main difference between the two reports is that the group culture report does not identify the participants by name in the report. Question #5: How do you use the Everything DiSC® Facilitator Report or Group Culture Report? Maximize the use of these two reports after the class and in future department meetings. These reports are a healthy and constructive way for teams to talk about their strengths and challenges. You can guide your team to a more meaningful conversation with the report’s questions-focused team culture.